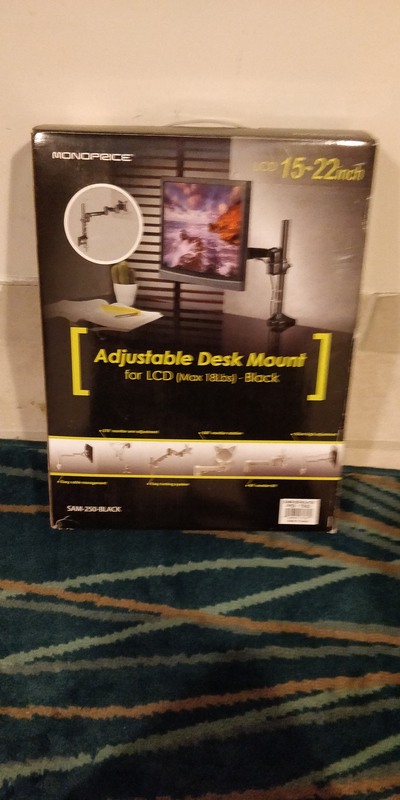 This adjustable desk mount is in great condition and will hold your monitor (up to 18 lbs). All the hardware is there for the clamp and the circular mount except the screws that go into the circular mount that would screw it into the desk. Should be easy to get some new wood screws if that's what you're into. Model is SAM-250-Black, which seems to be discontinued. It's old but it's easier to adjust than the new ones that are made of 45-degree angles. Check out the pic for more info. Local pickup only as it's too heavy for reasonable shipping.